On 21, October, 2009, NW188 departed SAN on a non-stop to Minneapolis, MSP. At 7:24P, Denver hands off the flight to Minneapolis Center, but at this point the flight drops off grid and goes NORDO. Minneapolis and Denver Centers continue to try and raise the flight, and Northwest Airlines dispatch goes postal trying without success raising the flight by company radio. About 8P, NW188 slides over the top of MSP at FL370, fat, dumb and happy. About 14 minutes later, the pilots finally plug back in and report they were over Eau Claire, WI, and "got distracted." The flight finally makes MSP and as a result of breaking Sections 91.13(a), 91.123 (a), 91.123 (b) and 91.135 (b), the pilots have been ordered by FAA to surrender their licenses immediately or risk civil penalties of $1,100 a day. Now along with the obvious questions of what went so terribly wrong on the flight deck of NW188, each pilot I know wants to find out why NORAD's fighters weren't scrambled with the flight being radio silent for 91 minutes. Doesn't anyone remember what happened to this country on 9/11 of 2001? It seems unimaginable that an airliner full of souls could be allowed to wallow through the skies unescorted, with no radio contact. But in researching this post, I came upon some super-secret NAV data that has yet to be published anywhere. To get this information, I had to leave an envelope of used, unmarked Monopoly money taped underneath a dumpster outside an unnamed ARTCC facility. NW188 lost radio contact just west of HUHHH, and flew a direct course to OOPSI. The flight continued on what appears to be a 070 heading until OSHIT intersection when the pilots realized they were in serious violation of just about every FAR every published. After regaining contact with ATC, they begin a 270 degree right turn over DUHHH, ending their turn at WTFFF. They realize they are now pointed at Santa's house, and crank a hard left turn so they at least look like they are trying to hit MSP this time. They now head sort of west on a 260 heading to JEEZE when they come to the realization that they again have shot past MSP. They aim the pointy end of their A320 on about a 170 heading back in the general direction of MSP, and again overshoot the field until over OHELL. They finally aim NW188 back north and at 854P make a safe landing at MSP, about 67 minutes late. Of course, this "scenic routing" most likely came from ATC, and not from the wayward pilots trying to really find MSP. We know this because after they checked back in with ATC and after realizing the severity of their error-filled excursion, you can bet they were following ATC direction to the letter. Regardless of how they got to MSP, they did eventually get there. Two things could have happened that didn't: (1) The flight could have ran out of fuel and had to be ditched in someone's corn field, with the risk of major loss of life. This had to be a possibility since these two pilots were missing all the bells, whistles, annunciators, flashing lights and radio calls, so it makes perfect sense they were also not managing their fuel. Or (2) NORAD – after 91 minutes of radio silence – finally wakes up and scrambles their welcoming party. And what if the pilots were sitting cross-legged on the floor of the flight deck "on their laptops", and didn't see those important light gun signals? After so much radio silence, the possibility had to exist that air-to-air missiles would have ended this flight before it ended itself in another terrorist attack. 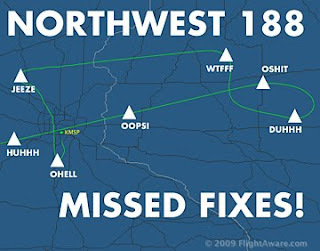 And finally, what would have happened had Northwest 188 encountered another craft that was also not in communication with ATC? What if they were flailing along at FL370 and came across Balloon Boy, up there in the flight levels setting a new altitude record in the Heene family's ridiculous, homebuilt spacecraft? Yes, this has been a really weird period in U.S. aviation. What else could possibly happen in our skies that is as strange as these two incidents? We should be careful tempting the Gods with that question.